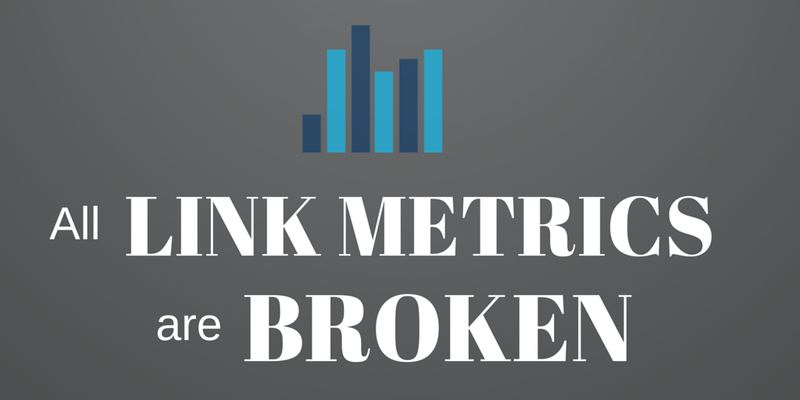 Link metrics have been used as a Key Performance Indicators by many SEOs for years – even decades… but link metrics such as Domain Authority and Toolbar PageRank give no useful indication of how acquiring a backlink from a certain website will affect the search performance of your own. One thing to keep in mind is that for most white hat link building strategies – like broken link building – you don’t want to spend too much time on your link analysis. After all, that’s time you could spend sending emails and getting links! Sure, a lot has changed in the last year – in particular, what constitutes “white hat link building strategies” (not that I’d accuse Brian of anything else). Regardless of semantics, there isn’t a single link acquisition tactic in 2014 or beyond, which requires analysis of any metrics whatsoever in order to be effective – and be proven effective. In 2013 Brian urged us to stop using PageRank. Only 2 months after Brian’s post was published, Matt Cutts said that the toolbar metric was broken and there were no plans to fix it. Finally, John Mueller stated towards the end of 2014 that Google probably won’t be updating toolbar PageRank moving forward. Far from a mad scramble for a new metric, most SEOs hadn’t relied on PageRank since around 2012. In toolbar PageRank’s favour was that it was the only metric to come directly from Google. A blog homepage with PR 0 was generally a good inclination that Google knew the site was selling links and should be avoided, but beyond this you would be hard pressed to find anyone – other than link sellers who managed to game the PR Toolbar – eager to brag about their PageRank. …because Domain Authority only takes link metrics into account, it’s not even a good guess how sites will perform in search anymore. Onsite factors are becoming much more important in how a site performs in Google, and user metrics are probably the single most significant factor. Because of this, you’re much better trying to acquire a link that will drive traffic to your website than a link located in the depths of a high Domain Authority site. Domain Authority is a reasonable guess as to how one site will perform in search overall when compared with another. It relies on the fact that the two sites being compared offer roughly the same number of services or products because authority could be coming from other areas which will change the metric. It also counts links in a disavow file, which obviously Google does not. Finally, Domain Authority doesn’t indicate whether a site is subject to any kind of penalty, which is obviously going to make a link from that site significantly less valuable. Because link metrics are a significantly smaller part of Google’s algorithm than they were when PageRank was last useful (not a coincidence), Domain Authority is not a good estimation of how much search traffic a site receives, and therefore how much traffic a link from that site can drive to your website. Majestic’s Topical Trust Flow metric is the closest thing to a reliable link metric that the industry has access to right now in my opinion. It succeeds for a couple of reasons, the main plus being that Majestic understand that it is relative and nobody seems to suggest that it’s more than just correlation. Ultimately these metrics are based on guesswork. I’ve never tried to report on the success of a PR campaign using a third-party metric like Trust Flow – it can be useful for making informed decisions, but it probably isn’t helpful as a KPI. The argument now is that link builders have a finite amount of time to spend acquiring links each month (time is money), but the truth is the right link targets usually take longer than the wrong link targets and that’s just a fact we have to face up to. The biggest sea change in SEO over the past few years is a better understanding of what we do from our clients. The kind of links we as an industry we’re building 10 or even 5 years ago were probably not questioned enough by the companies we worked with. It worked, but clients didn’t understand how and left us to get on with it. …when quality isn’t subjective metrics are vital. But marketing is subjective. Success should be reliant on getting the right links, not just the juiciest. Now our clients/managers/CMOs/mothers should be able to identify a high quality backlink, just by looking. Your audience reads this website. You should know who your brand wants to talk to. It’s not all up to SEOs to find this out but it’s not something you’re powerless to discover (see Laura Crimmons’ blog on audience research over at State of Digital for some pointers). You have something to point a link at. Whatever you’re linking to should add additional value to users who click on that link. I strongly recommend reporting on referral traffic from links as an absolute minimum – I’d go so far as to say you should be reporting on how that traffic converts and whether it bounces as well. A high bounce rate of referral traffic means as a link builder you’ve only done half a job. Number of social shares is a good indicator of how many people could have seen your content on an external website. Social shares of content on another website arguably have absolutely no bearing on how your website will perform in organic search – but neither does MozRank, so you’re much better off reporting on something that indicates humans have read it, engaged with it, and passed it on to more humans. It’s a much easier way of getting buy in for more activity than getting a link from a website with slightly higher PageRank than last time. Search rankings improve because your client is mentioned in the right context. People talk about your products in relation to your website and search rankings change – even without anchor text links. Typically, sites with more links perform better in search (it’s just that now worse sites with more links do not perform as well). You will never build more, better links than Amazon. Whatever industry you operate in you are very fortunate if you’re the market leader in search – for the vast majority of businesses online there is at least one player in the SERPs who cannot be caught in the sheer pace with which they acquire links. When a website is substantial enough to acquire links without any effort on their part, things like anchor text ratio and PageRank that SEOs used to care about will be spread pretty evenly. If quality is measured in a number on a toolbar, you can’t compete with this – but if quality is measured on converting customers then Amazon can be beaten. For SEO agencies and professionals responsible for link acquisition there is always a threat from PR agencies who have been reaching out and building relationships much longer than we have – but one thing that I don’t think will ever change is that SEOs are better placed to acquire the right links. PR professionals understand how to build relationships, but we know how the internet works. We know what gets shared – and more importantly – what gets linked to. We understand context. For us, coverage is a means to an end. So while PR agencies will probably achieve a better success rate in responses from site owners, and maybe even link numbers, we will always be better at successful link building campaigns. This was an excellent article and really does a good job of framing links in a modern context. Thanks for the read. Stephen, what do you think of LRT’s TRUST and Power metrics? Hi Harry, can’t say as I’ve used them. I’ve had a go with Link Research Tools for its original purpose but I guess that I found then – as in this case – doing things manually was my preferred option. Nice to read something about links I fully agree with for a change. One thing I would add to this is that several years ago I started to pay significantly more attention to Alexa Rank. Like you mentioned here Stephen I found that sites with high traffic were a good quality signal (and turn out to do wonders for your rankings.) Obviously used within conjunction of other signals, but still I’ve found it to be one of my preferred link metrics these days. Absolutely Martin. I think SEOs are starting to think more like PR people. Linkbuilding is a branding exercise.